This is a global map depicting the dissection density of valley networks on Mars, in relation to the hypothesized northern ocean. Two candidate sea levels are shown: contact 1 with mean elevation at -1,680 meters and contact 2 with mean elevation of -3,760 meters. Severallines of evidence point to the possibility of a past ocean on Mars, fromapparent ancient shorelines to chemicals in the soil. Addto the list anew map of the red planet's valleys. The map shows extensive valley networksaround the equator and in the southern hemisphere, suggesting a warmer Marslong ago, with extensive rainfall that would have fed an ocean in the northernhemisphere. "Allthe evidence gathered by analyzing the valley network on the new map points toa particular climate scenario on early Mars," Northern Illinois Universitygeography professor Wei Luo said. "It would have included rainfall and theexistence of an ocean covering most of the northern hemisphere, or aboutone-third of the planet's surface." Thevalley networks are more than twice as extensive (2.3 times longer in totallength) than had been previously mapped out. "Thepresence of more valleys indicates that it most likely rained onancient Mars, while the global pattern showing this belt of valleys couldbe explained if there was a big northern ocean," said Tomasz Stepinski ofthe Lunar and Planetary Institute. Luoand Stepinski published their findings in the current issue of the Journal ofGeophysical Research ? Planets. Fornearly four decades, scientists have debated whether the valleynetworks on Mars were created by surface water erosion or some otherprocess, such as groundwater sapping, which can occur in cold, dry conditions. Oneargument against rainfall had been that the valley networks on Mars were not asdense as on Earth. The new map shows the densities on Mars are greater thanpreviously thought. 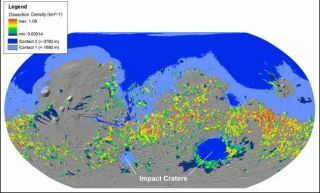 "Itis now difficult to argue against runoff erosion as the major mechanism ofMartian valley network formation," Luo said. "Whenyou look at the entire planet, the density of valley dissection on Mars issignificantly lower than on Earth," he said. "However, the mostdensely dissected regions of Mars have densities comparable to terrestrialvalues." Themapping project, funded by NASA, used topographic data from Mars satellitemissions, fed into a computer algorithm. "Theonly other global map of the valley networks was produced in the 1990s bylooking at images and drawing on top of them, so it was fairly incomplete andit was not correctly registered with current datum," Stepinski said. "Our map was created semi-automatically, with the computer algorithmworking from topographical data to extract the valley networks. It is morecomplete, and shows many more valley networks." TheMartian surface is characterized by lowlands located mostly in the northernhemisphere and highlands located mostly in the southern hemisphere. Given thistopography, water would accumulate in the northern hemisphere, where surfaceelevations are lower than the rest of the planet, thus forming an ocean, theresearchers said in a statement today. "Sucha single-ocean planet would have an arid continental-type climateover most of its land surfaces," Luo said. Thenorthern-ocean scenario meshes with a number of other characteristics of thevalley networks. "Asingle ocean in the northern hemisphere would explain why there is a southernlimit to the presence of valley networks," Luo added. "Thesouthernmost regions of Mars, located farthest from the water reservoir, wouldget little rainfall and would develop no valleys. This would also explain whythe valleys become shallower as you go from north to south, which is the case. "Rainwould be mostly restricted to the area over the ocean and to the land surfacesin the immediate vicinity, which correlates with the belt-like pattern ofvalley dissection seen in our new map," Luo said.